Once a week I like to have a good body exfoliate and this is my current exfoliator, which I received as a present for my birthday. 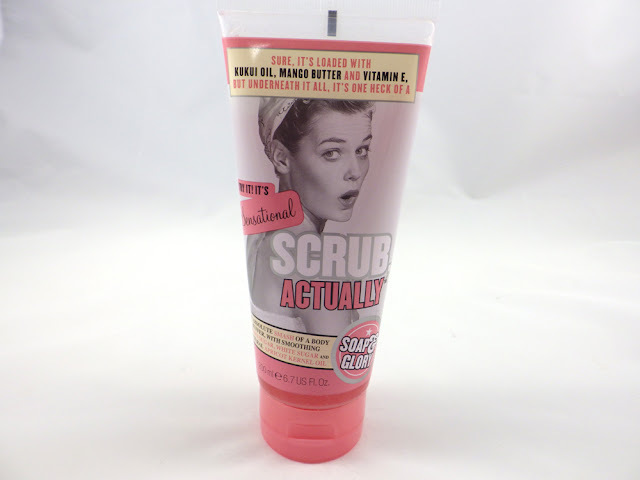 Being a huge fan of Soap and Glory's Breakfast Scrub, I couldn't wait to give their Scrub, Actually a try. Soap and Glory say, "An absolute smash of a body buffer, with smoothing brown sugar, white sugar and natural apricot kernel oil. Loaded with kukui oil, mango butter and vitamin E. Scented with our fruity Blueberry fragrance." I really do like the formula of this; the grainy sugar granules surrounded in a mix of moisturising butters and oils are a winning combination. The butters and oils prevent the sugar from being too harsh on your skin when exfoliating and leave it soft and hydrated afterwards. Everything just sort of melts into the skin, so no risk of finding the odd stowaway granule once you get out of the shower! I absolutely love the fruity scent too, it's really fresh and reviving. If you want a hydrating exfoliator then Soap and Glory's Scrub, Actually is a great solution and I would definitely get another when this runs out. 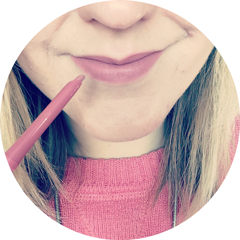 I still love The Breakfast Scrub but the two are very different; I'd use The Breakfast Scrub for a more intensive exfoliate as the formula is drier and lot more scrub-by! Scrub, Actually is £7.00 for a 200ml tube and can be purchased from Boots here. What's your favourite body exfoliator? I've saw many reviews about it but I've never seen a picture of how it actually looks like.. So beautiful and fun! Me wants! Oh wow! This product sounds absolutely amazing! I am currently loving The Body Shop's cocoa butter body scrub, but I think I'm definitely going to give this Soap & Glory scrub a go sometime soon! Great review! Something I really lovely this stuff! But then again there isnt much from them I dont love!